In this heartwarming story, Kate is faced with a difficult choice. Her father's dying wish was for her to live with each of his estranged brothers - ultimately choosing one family with which to make her home. Although their motivation varies, all are anxious to have her - one because of her money, another because her great-grandfather had been a lord, a third in hopes of securing her hand for the son of a close friend, and a fourth because of love for her alone. Which will she choose? 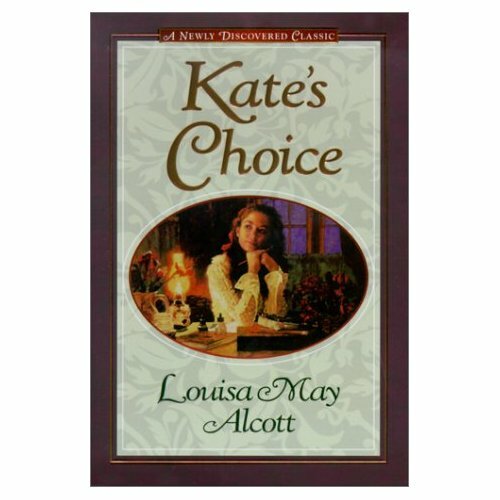 Join us for the memorable story of how Kate makes the best choice of all. Although the title of this book is Kate's Choice there are actually two other stories, What Love Can Do and Gwen's Adventure in the Snow. I have to admit that the last story is actually my favourite, not the main one. Written for newspapers or magazines when Alcott was first embarking on her writing career, these remained undiscovered until recently. Each of the stories centres around Christmas in some way. In the title-story, Kate is left orphaned just before Christmas and moves from England to America to be with her father's relatives. It was his wish that she visit each of his brothers in turn and choose who she wanted to live with. But Kate discovers her father's mother, alone in her big family home, and sets about bringing all of the relatives together at Christmas in order to cheer up her grandmother. In What Love Can Do the neighbours of a poverty-stricken family overhear the children talking about how they can't afford any Christmas gifts and decided to surprise them. And in my personal favourite, Gwen's Adventure in the Snow, Gwen and her cousins go for a sleigh ride and are struck by a blizzard. Sheltering in the family summer house, they have to make do with the few supplies they can scrounge and camp out until the storm is over. I think this one is my favourite because, as a child, I always adored stories about children "playing house" with the odds and ends that they discover in a shed, cellar, tree-house, abandoned house, etc.